versatile design, the magicolor 3300 is well equipped to handle the ordinary and extraordinary demands of the office on the go. With the click of ‘Print’, the magicolor 3300 reacts fast, printing up to 26 pages per minute (letter), 24 ppm (A4), in black & white and full color. A tandem, single-pass engine powered by PRISMLASER Technology gives the magicolor 3300 its quick, reliable performance. The magicolor 3300’s got the office covered, supporting Windows, Mac, UNIX, and Linux. It also includes a 10/100BaseTX Ethernet interface for high-speed user access. The magicolor 3300 prints on envelopes, plain paper, labels, glossy stock, and transparencies and supports media from postcard (3.5" x 5.5") to banner size—up to 8.5" x 35.4"! With 1200 x 1200 dpi resolution, the magicolor 3300 produces excellent business graphics, highlight color, and attention-grabbing images to make business documents stand out. magicolor 3300 can do the same with an extra 500-sheet or 1,000-sheet feeder to maximize paper input. A standard feature on the DN model (optional on the EN*), an automatic duplexer creates two-sided documents while reducing paper usage and costs. Internal Hard Disk: (optional) for downloaded fonts, forms, and profiles; Job Accounting; spooling; collation; PDF printing—up to 2.2 GB supported. 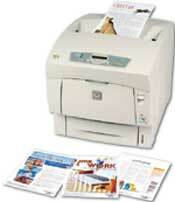 Print Media: Plain paper, thick stock, glossy stock, OHP transparencies, laser-quality labels, and envelopes. Duplexing on plain paper only. Weight: w/o consumables: 64.2 lbs. (29.2 kg); w/consumables: 76.8 lbs.